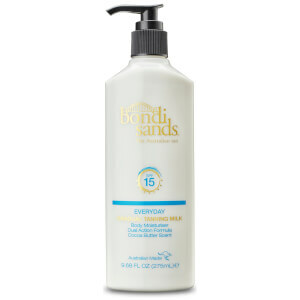 Achieve sun-kissed colour with the Bondi Sands Everyday Gradual Tanning Milk SPF 15; a lightweight, quick-absorbing moisturiser that delivers a golden glow all year round. Inspired by Australia’s iconic beach, the innovative, dual-action formula blends Aloe Vera and Vitamin E to nourish and hydrate skin, whilst added SPF 15 protects against the sun's harmful rays. Perfect for everyday use, the gradual tan delivers an instant hint of bronze that slowly intensifies to leave the body with deep, long-lasting colour.